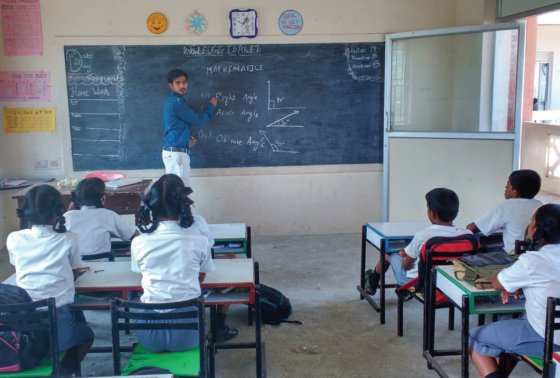 We can put up a hundred buildings – our tally is actually five including the 1000-pupil high school – but they aren’t worth a string of beads unless they’re doing their job: giving the children of Kovalam an excellent education within their walls. The fact that we now have 65 of our sponsored children at university or other colleges – and another 35 already graduated – speaks for itself. But it needs more than the children’s dedication to pursuing further education, it needs the parents’ blessing too. The children come from the poorest of homes and it would be understandable if parents sought pay packets from them as soon as possible. To their credit, most recognise the importance of further education and are hugely grateful for the opportunities VMT is giving to their children. When a young person moves on from school to university or vocational training, the poverty mould will be broken and a bright future awaits them, their families and future generations. I spoke to several students and their mothers when visiting Kovalam recently. Their stories show just what a difference the Venkat Trust is making to their lives. Perhaps the most poignant of them all is the family of Moideen Basha, now in his second year of a three year BCom degree. While still a toddler, his father left home with him and his baby sister and placed them in an orphanage. It took his frantic mother a year to trace them and bring them home. 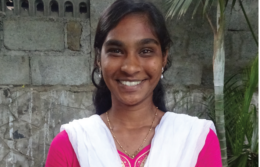 As her income is miniscule from whatever work she can find, she is extremely grateful for the sponsorship money for the welfare of Moideen Basha and his 17 year old sister, Rajeya Banu. Most parents in her situation would have insisted that both of them left school to start earning but she realises that it is worth making the sacrifice now so that their future is secure and poverty free. Sakana was our fourth sponsored child. She was just eight at the time, now she is 18 and in her first year at university, doing well in her studies for a BCom after which she plans to do a post grad degree. QED? Thanks to VMT, yes, but her mother told me that without our help she would have had to leave school at 12 when free education stopped (the high school had yet to be built). Sakana is one of six children. The family lives in a one room house and her father ekes out a living getting labouring jobs as and when he can. Now the parents can look forward with pride to their daughter’s future career. She has definite plans for it: to be a bank manager. There’s an exception to every rule and while children for sponsorship are usually selected by trustee Ali, Parveen took it upon herself to get sponsored. Taking her courage in her hands, this very appealing 12 year old came up to fellow trustee Lindsay and me on the beach to plead her case. And won! She met all the criteria and now this clever girl is in her second year of a nursing diploma which will be followed by a degree course. 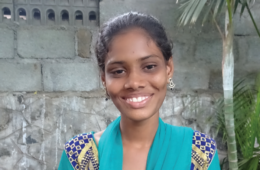 Her single parent mother who has two other children said that Parveen, like Sakana, would have had to leave school at 12 and work as a shop assistant. Among our 22 graduates now thriving in their careers and able to contribute to their families’ income is Abdul, a VMT university scholarship winner, whose fees for his four year engineering degree would have been impossible for his shopkeeper father. 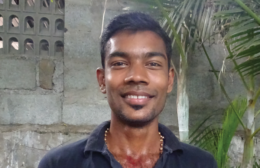 Now with a BE after his name, Abdul’s future career is secure and he is enjoying his job as the maths teacher at a primary school. 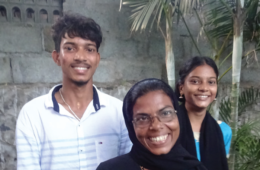 Our two post grads with Masters degrees have excellent jobs: Roobini is an executive at the international IT company, HCL, and Sumithra haD a job she loveD at Chennai’s largest leisure complex before moving recently to the Gulf to live with her husband. Other graduates’ jobs range from engineering to publishing, management to nursing.